There appear to be only about 17 extant photographs of Emperor Norton — one from the early 1850s, during his time as a successful businessman in San Francisco; the others, from various times during his reign as Emperor. The photographs rarely are collected all in one place. Here they are, roughly in chronological order. Scroll down for descriptions. Scroll further for a couple of disputed photos; details about these are appreciated. 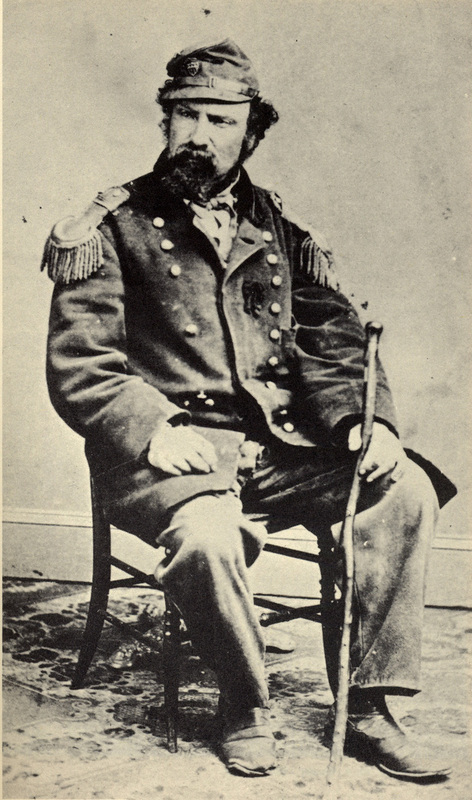 (a) Joshua Abraham Norton, 1851. Collection of The Society of California Pioneers. (b) Emperor Norton, early 1860s. The only photograph of him as Emperor sans epaullettes, suggesting that it may be the earliest of the Emperor photos. Collection of the Bancroft Library, University of California Berkeley. (c)-(d) Emperor Norton, 1864, by Bradley & Rulofson studio. Possibly from the same sitting. (c) Collection of the Bancroft Library, University of California Berkeley. (d) Collection of the California State Library. (a)-(d) Emperor Norton, early March 1869. Two photographs by Eadweard Muybridge. Taken in front of the fourth Mechanics' Pavilion, at the northwest corner of Stockton and Geary Streets, in San Francisco. Note the scrap of paper, bottom right, with the word "Helios." This was the name of Muybridge's studio. (a) A stereograph of one of the photographs. Collection of the Bancroft Library, University of California Berkeley (part of the Lone Mountain College Collection of Stereographs by Eadweard Muybridge, 1867-1880). (b) A sepia-toned version of a second photograph taken from a slightly different perspective. Collection of the Bancroft Library, University of California Berkeley (part of the Lone Mountain College Collection of Stereographs by Eadweard Muybridge, 1867-1880). (c) A black-and-white version of (b). Department of Special Collections and University Archives, Stanford University Libraries (part of the Eadweard Muybridge photograph collection, 1868-1929). (d) A cropping of (b), possibly from a postcard, mounted in one of two scrapbooks (titled "Album of San Francisco") of images collected by Hamilton Henry Dobbin (1856-1930). 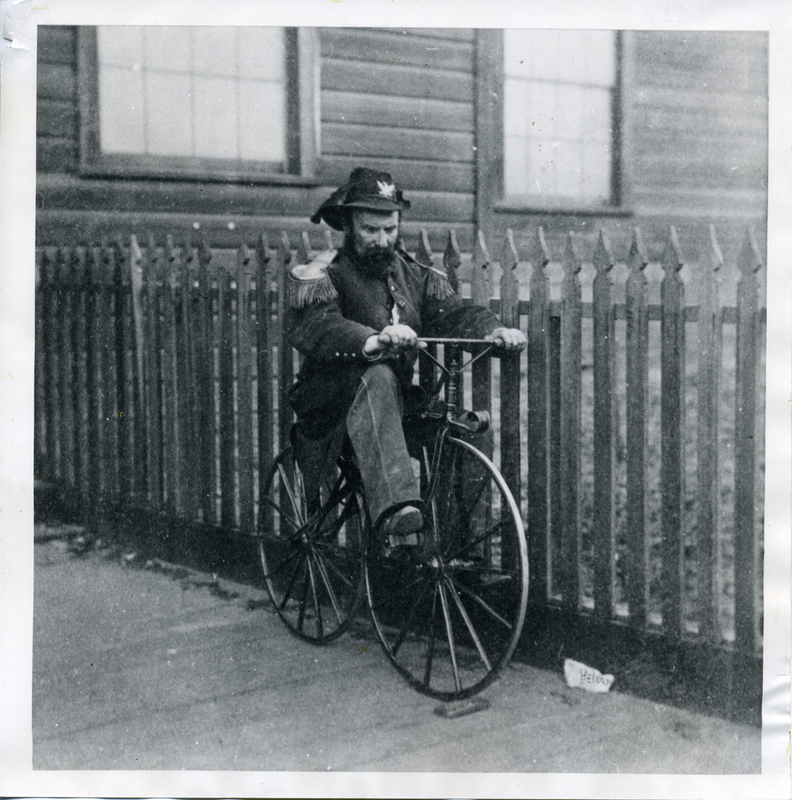 The caption below the photo ("Emperor Norton in carriage of State 1869") is by Dobbin. Collection of the California State Library. (a) Emperor Norton, between spring 1871 and spring 1872. From carte de visite by Tuttle & Johnson studio, 523 Kearny Street, "Heliographic Artists." Collection of the California Historical Society. (b) Emperor Norton, early 1870s. This undated, uncredited photo appears in the book by Misha Berson, The San Francisco Stage: From Golden Spike to Great Earthquake, 1869-1906 (San Francisco Performing Arts Library & Museum, 1992). The photo is sourced as being in the collection of the Museum, which now is called the Museum of Performing Arts & Design. Note that the Emperor is wearing the same hat, with the same feather adornment, here as in the Muybridge photographs in Row 2. 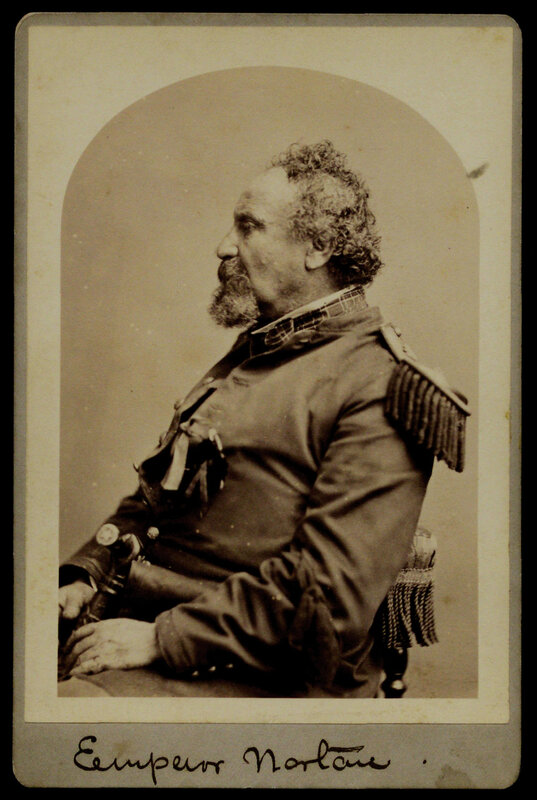 (c)-(d) Emperor Norton, c.1874, by Thomas Houseworth & Co. studio, probably the same sitting. (c) Cabinet card, source unknown. Image © 2016 Bonhams & Butterfields Auctioneers Corp. A cropped view in the collection of the California Historical Society is here. (a)-(b) Emperor Norton, c. 1875, by Bradley & Rulofson studio. Apparently from the same sitting. (a) Collection of the Oakland Museum of California. (b) Collection of the Bancroft Library, University of California Berkeley. (c) Emperor Norton, 1870s. 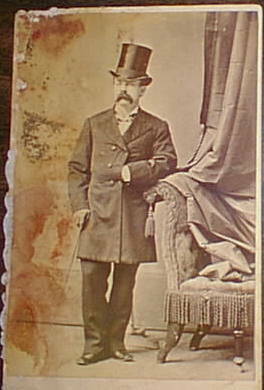 From cabinet card by Thomas Houseworth & Co. studio, 12 Montgomery Street. Large blue-tint logo on the reverse: "Houseworth Souvenir Photographs." Collection of the California Historical Society. (d) Emperor Norton, 1870s, by Bradley & Rulofson studio. Collection of the Bancroft Library, University of California Berkeley. (a) Emperor Norton, cabinet card published between late May and mid June 1879, by Imperial Gallery, 724½ Market Street, San Francisco. Photographs possibly by gallery owner Hector William Vaughan (c.1827–c.1878). Signature and seal on the reverse: "Norton I. Emperor U.S. & Protector of Mexico. 19th Day of June 1879." Collection of the California Historical Society. (b)–(c) Emperor Norton, c. 1878, by Bradley & Rulofson studio, 429 Montgomery Street. Probably from the same sitting. (b) Collection of the California Historical Society. (c) Collection of the Gilder Lehrman Institute of American History. The following two photographs are persistent outliers. 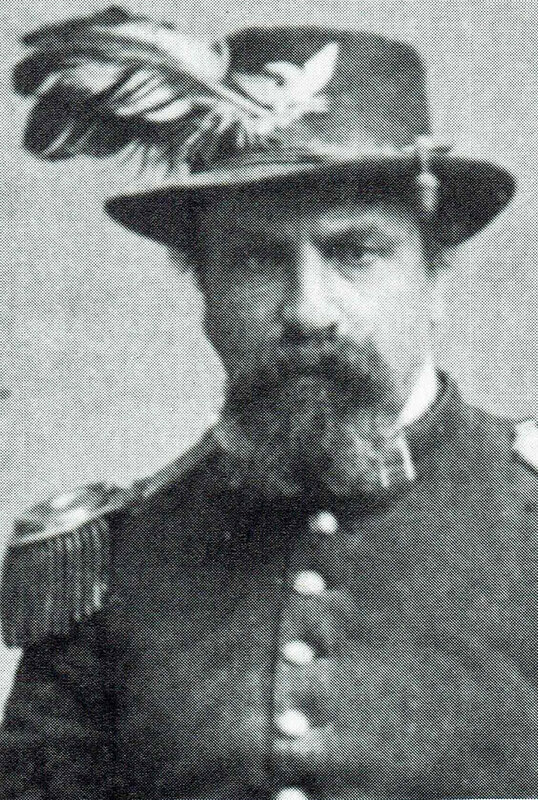 It's been suggested that one, or both, of the photos may be of Emperor Norton. But there's not enough information to confirm the authenticity of either. Left: Photograph listed on eBay around 2000. 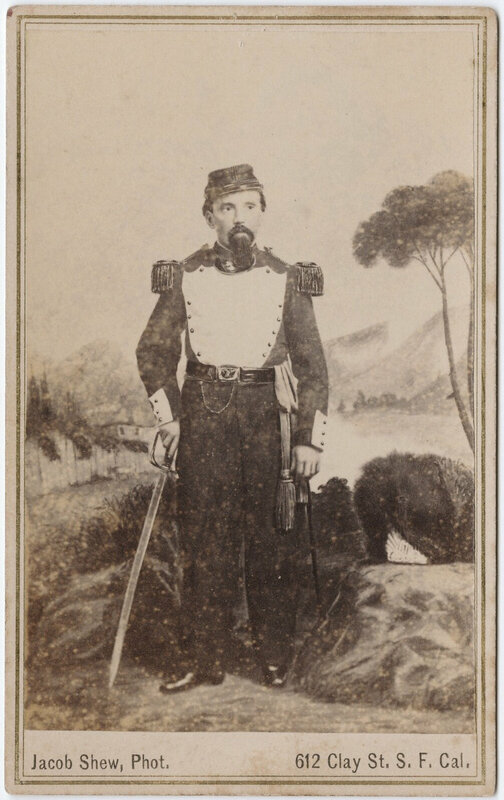 Listing identified the photo as "a circa 1850s-60s...picture of Joshua A Norton" and quoted a notation on the back identifying the subject as Emperor Norton. Source: EmperorNorton.net. Right: Photograph by Jacob Shew (1826-1879). Collection of the Beinecke Rare Book & Manuscript Library, Yale University. The Beinecke dates this carte de visite — which is pencilled "Emp Norton" on the reverse — as "c. 1860." But the studio address on the front of the card is 612 Clay Street, San Francisco. And, according to Peter E. Palmquist and Thomas R. Kailbourn in their book Pioneer Photographers of the Far West (Stanford, 2000), Jacob Shew didn't move to his Clay Street studio until mid 1867; he moved again, to 513 Montgomery Street, in 1871. Assuming that Shew took this photograph between 1867 and 1871, a comparison of the photo to the photos of Emperor Norton dated 1864 and 1869 (see Rows 1 and 2 in the main collection, above) would seem to confirm that the person in Shew's photograph is not Emperor Norton. Also: The beard in the photo looks fake — possibly a photographer's prop for a young boy.